The stone building of Flagg was originally the village school built in 1833. In 1977, on closure of the primary school, it was converted to meet the needs of younger children and became Flagg Nursery School, one of only 8 nursery schools in Derbyshire. The nursery school contains a large classroom surrounded by the office, porch, toilets, kitchen, utility room, storeroom and verandah as well as a purpose built link to the 'big classroom' in the newly refurbished chapel building. The outdoor environment is landscaped to provide sheltered seating areas, walkways, log structures, gardening areas and a woodland area for the investigation of mini-beasts. 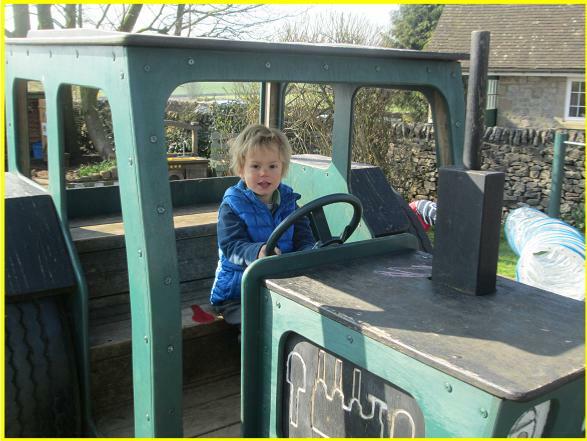 A large timber climbing frame, monkey bars and our unique tractor, set safely on an impact absorbent surface, provide challenging physical and imaginative play. Daily outdoor activities are an important part of our curriculum provision and a wide range of good quality educational play equipment is available to meet the needs of all children. Out of school hours the garden is used by the local community.